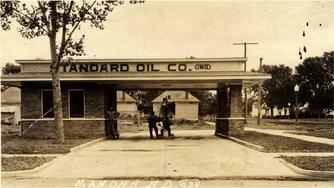 As with the majority of the country, the 1920s brought growth and prosperity to Mandan. The most significant event, the first automobile bridge across the Missouri River in the Dakotas in 1922, prompted a surge of commercial development in downtown Mandan. While North Dakota was a "dry" state since it joined the Union in 1889, many told and untold events were associated with alcoholic beverages in Mandan. The largest project funded by the US Congress in 1919, the Liberty Memorial Bridge was dedicated on September 19 to the veterans of World War I. The automobile bridge linked the cities of Mandan and Bismarck, and was the final piece to complete the first transcontential highway, without the use of ferries for river crossing, along the entire National Parks Highway system. 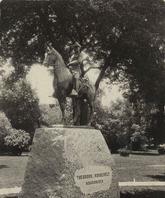 The Roughrider statue depicting Theodore Roosevelt was dedicated on July 2. Dignitaries including members of the Roosevelt family and high level politians from throughout the state attended. The statue was donated by Mandan's first mayor Henry Waldo Coe who was a life-long friend of Roosevelt. Additional information on the statue and the ceremony is found under the [Area Landmarks] tab.